One account in the service is for one device only, so if you want to use a second or more devices please use a different email to register. 1 - Enter a Report ID or close the box and get an automated ID (date / time). The ID will be the subject line in the email alerts so Reports can be easily found in your email inbox later on. Before pressing Start, you can hold the device in landscape to get widescreen video. 2 - Press START, record the video for up to 30 seconds, then STOP. Explain the situation as a voice-over during recording. 3. - On the Report Page you can add email Alert recipients, review the video, send, save or delete the Report. Subscription users have a drop-down arrow to enter multiple email and SMS text Alert Recipients. EITHER send Reports immediately and keep the app switched on until the upload is complete OR save them and send all together later on. The correct time and location details will always appear on the Report Page, either way. If there is no network when you try to send a Report, it will automatically be stored in Unsent Reports. The Settings page gives you access to ten of your most recent Sent Reports and an unlimited number of Unsent Reports. You can also update your details, Contact Us or Subscribe from here. Messages: to read incoming messages from Alert Recipients. A code box to share the re-branding of Report Pages. Users will always be sent an email alert for every Report you create; you can download and share the Report from the links at the bottom of the Report Page. With no lock-in beyond one month. The Report Page is stored on a secure remote server for up to one year during which it can be accessed at any time. After that it will be deleted, so you should download the Report if needed for longer. Subscribe to have unlimited access to all Reports AND the ability to re-brand your report pages with your own logo AND a text box for Alert recipients to message the sender. Report Pages are stored on a secure cloud-based server so they cannot be edited or tampered with, delivering evidence more informative and compelling than ordinary video and pictures. My-Proof has been designed to be re-branded and re-versioned by business and corporate clients, to function and publish as your own app. It can also be integrated into your existing app, CRM and IT network, adding value with enhanced functionality. This service is available now, allowing you to publish your version without delay and at a fraction of the cost of a new build. It is risk-free to, as you will acquire a stable fully-developed platform with the back-end service taken care of by us. And the Report Page will be re-branded as well as the app, so recipients be presented with the video and related data with your logo & livery. The business model for re-branding the service is flexible, depending on the intended use, including the option to offer it free to your customers to send reports back to you. If you represent multiple users you can give them use of a special VU version with more features and functionality than the standard version FREE both to you and to them. Those who choose to subscribe also get a 10% discount on the normal price. 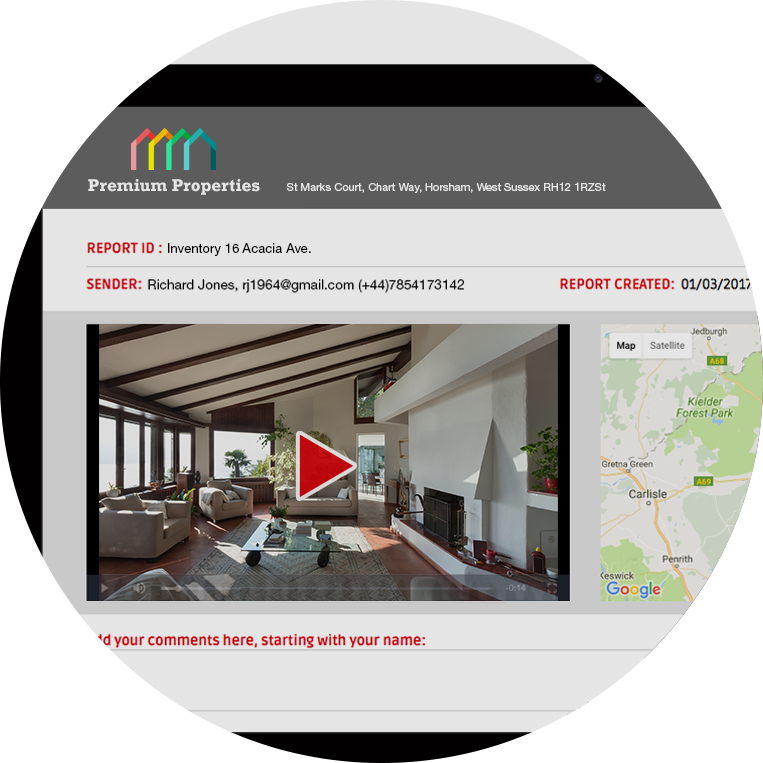 No need for a special White label build, all that’s needed is to Contact Us to get a login to this special version of ReportCam, then send a link to your user group so they can install it directly onto their Apple or Android devices. No cost, no fuss, no risk… so it’s great for you and for them. 1) Monthly Subscription - with Automatic Renewal. With Automatic Renewal your subscription will automatically renew at the same time every month until cancelled. You can cancel at any time. If you cancel at least 24 hrs before renewal, it will expire at the end of that month. 2) Monthly Subscription - no Automatic Renewal. With no Automatic Renewal your subscription is for one month and will then expire unless you manually extend for a further month. To set up a Monthly Subscription with Automatic Renewal within the app, go to Settings - Account then from the drop-down menu select "With Automatic renewal: BUY NOW". To set up a One Month Subscription with no Automatic Renewal within the app, go to Settings - Account then from the drop-down menu select "Without Automatic renewal: BUY NOW". My-Proof is available as a monthly subscription service, with automatic renewal. At a price of £9.99 per month ( or equivalent in Euros or USD) the full service is available, with no additional charges. Payment will be charged to your iTunes account at confirmation of purchase. Any unused free trial period will be forfeited on taking out a subscription. Your iTunes account will be charged the same price for renewal automatically within 24 hours of the end of each monthly subscription period, at which time you will receive notification of renewal. You can cancel your subscription any time through your iTunes account by going to Settings - iTunes & App Store - touch your Apple ID - then View Apple ID & enter your password (or touch ID) - Subscriptions. Here you will see the option to cancel a subscription. My-Proof is also available as a monthly subscription service, without automatic renewal. At a price of £9.99 per month ( or equivalent in Euros or USD) the full service is available, with no additional charges. Payment will be charged to your iTunes account at confirmation of purchase. Any unused free trial period will be forfeited on taking out a subscription. One month after the subscription begins, it will automatically expire unless it is manually renewed by you. Auto-Renewal can be activated in your Account - Subscribe settings within the app. My-Proof is FREE to download and use, with no limit on the number of Reports you can create. If you subscribe to get the full functionality, a charge of £9.99 per user per month then applies, payable through the app stores in the usual way. If you qualify to recover VAT, this works out at under £2 per week. There are no hidden charges, everything is included - even the ability to re-brand Report Pages with your own company logo and details. And there is no limit to the number of reports you can produce. There is no lock-in, so subscriptions can be cancelled at any time to take effect at the end of the month of cancellation. To move the subscription from one device to another, sign out of the My-Proof account on device 1 and sign in on device 2. The app works on Apple and Android phones and tablets, and one account can only be used on either Apple or Android devices. My-Proof functions worldwide, please refer to your iTunes or Google Play store for pricing in different currencies. To re-version the app and release as your own, possibly free to your customers, CONTACT US to discuss our WHITE LABEL service. Complete this FORM using the same email address as used in registering for your account. Your Report pages will automatically use your logo and messaging, once approved. And you will be given a code to share with other users wanting the same logo, they simply enter it into the code box under Settings in their app.